It's my berf-day. I'm 35, and you know what? But we'll get back to that in a minute. First, check out these trouble makers. Their imperfection is so yummy, I could eat it with a spoon. When I spotted this variation on Pinterest, I got goosebumps. I mean COME ON. Scrumptious. I clicked over to check out Jill's directions and she even had a free printable template. And, obviously, some kind of special kool-aid (that I must have sipped) because I got the notion that I could TOTALLY DO THIS. Especially since I already had this thrift store shirt that I scored for 99 cents. I snatched it up even though it was a small, because hello? Cute, stripe-y and perfect for layering. Or at least it WOULD be perfect for layering. IF YOU WORE A SIZE SMALL. But now I'm tired of dealing with my teenage angst of loving something that I just. can't. have. and have realized that sometimes things come into our lives for reasons that we can't always see at that exact moment. I took my template and some scissors (that I could use just fine, even with my non-small hands) and went to work. I opted out of adding feet because they gave me too much trouble, and instead of felt arms and back, I used bits of leftover black apron fabric and some denim. Because everyone knows I can't throw away worn out jeans. I left the top of the pocket open so it's still functional. Maybe a tooth fairy pillow? A place to keep worms dug up from the backyard? Whatever you want it to be. The "Room of Requirement" of penguins. In this case, I needed it to be a baby gift. Now that y'all are experts in wrapping, you recognize my madness. An initial and scrapbook paper carries on the denim/black & white theme without being....themey. He can travel in style to his new home. Speaking of traveling, did I mention Mr. Penguin had a friend? He does. Or at least he did, before I split them up. Since it's MY BIRTHDAY, I hereby decree that it's present time. FOR YOU. Leave me a comment telling me your favorite color (or whatever else you want - I'm not picky), and I'll randomly pick a winner to get a penguin and a piece of birthday cake. Okay, no cake. But yes to the penguin. Open through midnight on Sunday, Nov. 20th. My sweet 4 year old Jaimee just saw the cute penguin and what an awesome surprise it would be to give it to her for Christmas! BTW my favorite color is blue. Adorable. Happy Birthday girl!!! I have (to my shame) never had a favorite color. MY favorite flavor is chocolate. This is adorable! And I totally want cake. I'm near enough to you that I think we should share. I'll totally buy for you. Awww...And today, my favorite color is purple. Sometimes its blue and then green, or various shades of purple. Even blurple. Definitely purple, today, though. Maybe. I'm not sure. Regardless, HAPPY BIRTHDAY!!! *whispering* my gifts this year are gonna be the bomb thanks to your wrapping ideas. I went on a $10 shopping spree at Dollar Tree just for the purpose of having fabulous wrapping. yaaay! don't know why I felt the need to whisper. maybe because I want everyone who gets a gift to be shocked! Happy Birthday! 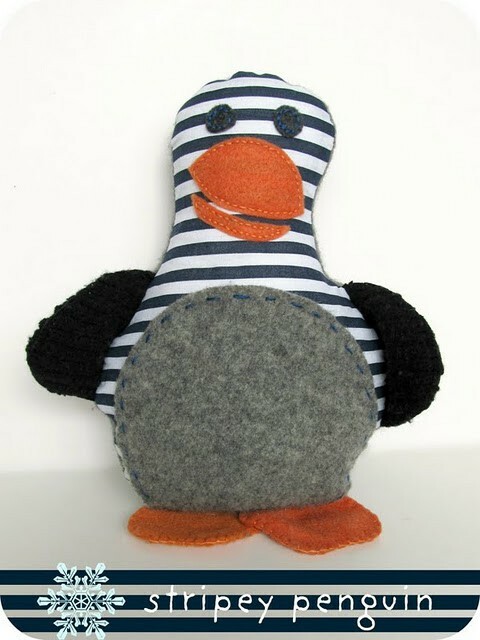 What an adorable penguin, I love the stripiness! Today my favorite color (if you want to call it that) is animal print! Hope you have an extremely fabulous birthday! 2. How adorable! Even if I don't win, I am pretty sure my boys need penguins for Christmas. Matching Christmas penguins...yes! Happy Birthday! I love your blog and hope that in my next life I can be as creative as you are. At least I can enjoy it vicariously ... and my favorite color is brown. I know, kind of pathetic. But there it is. My favorite color is BLUE! always have been. and i'm pretty sure its because its the color of my eyes. also, happy birthday!!! 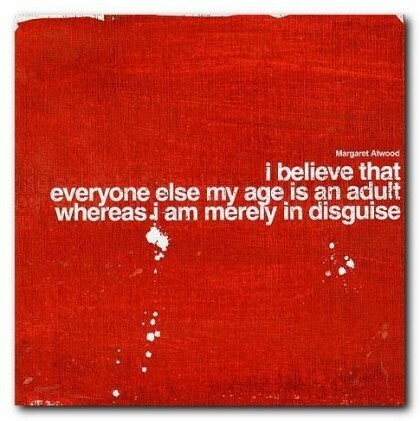 you are an adult in disguise because you certainly dont look 35! enjoy your special day! I turned thirty this year and am still wanting for the age fairy to come sprinkle some grown-up dust on me. HAPPY BIRTHDAY! You and your family are still remebered and missed in the neighborhood! Happy birthday! These are REALLY cute! Have you ever thought of wrapping boxes with NOTHING in them and then getting mad at the person for tearing open the box and ruining the GIFT (which was the adorable wrapping job?) You should try that with me this christmas. Happy Birthday!!! I'm loving green right now, but I like all colors at different times for different reasons. Happy Birthday! My favorite color is blue. Happy birthday QUEEN CREATIVE! Blue would be a perfect color for a friend of mine thats having a baby! Her babies room theme is animals. How adorable! Pink or yellow. Love them both and Happy Birthday! Green is my favorite color. And that guy is ADORABLE. Happy happy birthday, from all of us to you, we wish it was our birthday, so we could party too, HEY! I agree - thrift shopping is a blessing & a curse. Somethings are SO CUTE, but SO NOT MY SIZE. It stinketh. But that flipperless penguino rocks! Thanks for sharing the stripes! Happy birthday to you! I think my favorite color right now is grey. I know, it sounds boring, but I love it, it's not too dark, not too bright. And I like stripes, too! Adore your writing voice and totally making this an RSS feed! p.s love your writing style, loved your 'rap' and laughed the whole time with you! Happy Birthday! I found you through pinterest (gift wrapping series) and now have your blog in my favorites. Thanks for the chance to offer the cute penguin a home. My favorite colors are "beachy"! Happy Birthday! Those are adorable! I loved your neat wrapping paper as well. Actually I have no idea what puce really looks like. I just enjoy the auditory closeness to "puke". I just finished selling at a holiday bazaar that I sort of dreaded doing, but then turned out to be totally inspirational. 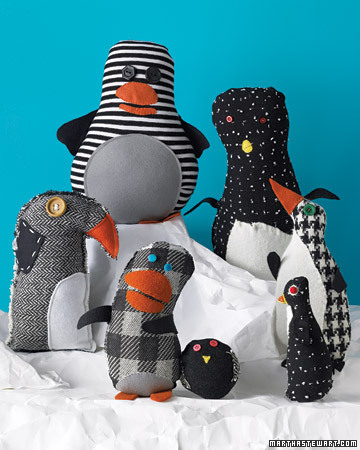 In the midst of looking for more time-sucking crafts, I stumbled upon your blog, and penguins, and love it. Anyway. Hi. LOVE the Penguins!! My middle son's favorite lovey is his penguin! Found you through Pinterest! Favorite colors are turquoise and chocolate brown. Pengins!!!!!!!! Not like it is a Surprise that MY Favorite movie of all time is Happy FEET!!! I didn't get to the opening of "HAPPY FEET 2" on YOUR Berf-Day.... However, I will see it sometime this week! Can't wait to see what the "3 Amigos" are up to this time! Looking forward to more penguins this year! Love your version. He is adorable! Happy Berf-day! Girl, no wonder you have been MIA, you went to the North Pole! Happy Day!! happy birthday to you!! 35 is such a great number. so solid. and feisty sounding. ;) hope it was a great one! Just found you by way of pinterest. 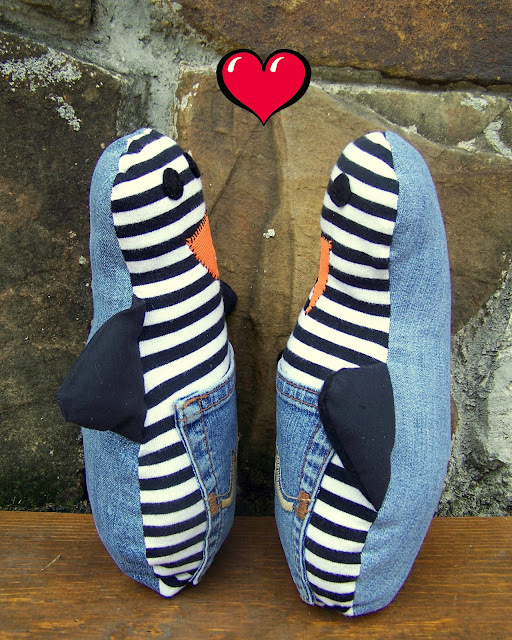 LOVE your penguin! Freaking adorable! LOVE your blog! And I hope you had a terrific birthday!!! Happy Birthday (yesterday)! The penguin is too cute, love the card and I'm stealing that saying, putting it on a t-shirt and will wear it every day - love it! Hope you had an amazing birthday! My sister's classroom mascot is a penguin, she would love this one. Too freakin' cute. I love stripes, polka dots, any pattern really, but those are my favs. You are so creative it makes me think that I can do it too! Happy Birthday! I linked to your Pinterest-Pic, is it okay?